At the beginning of the nineteenth century, meals could be obtained at chop houses, coaching inns, hotels, and coffee houses, yet all these ways of eating were deemed unsuitable for respectable women, who generally ate at home. This situation changed in the 1860s with the arrival of better railway hotels, who welcomed women in the dining rooms, and in the late 1880s, with the appearance of restaurants such as the Holborn, the Criterion, and the Gaiety. Women were welcome also in tea and coffee shops, of which began to appear in London in the 1870s when several temperance societies opened them. By 1879, London contained 100 such establishments, many of which offered food and entertainment. However, those owned by temperance societies were often mismanaged and of poor quality, and were relatively short-lived. What did survive, was the Aërated Bread Company or A.B.C., which was founded in 1862 by Dr. John Dauglish. Though originally founded to mass produce healthy, additive-free breads using a new bread leavening technology invented by Dauglish, the company found its name on its famous tea-shops, of which the first was opened in 1864 in the courtyard of London’s Fenchurch Street Railway Station. Soon, tea rooms opened up all over, and a rival to the A.B.C. firm arrived as well: that owned by Joseph Lyons, who opened his first tea shop on Piccadilly in 1894, and the first of his famous Corner Houses 15 years later. 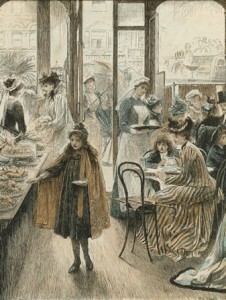 These establishments not only offered afternoon tea, but provided, for the first time, a place that an unchaperoned young lady could visit with her friends and maintain her reputation. Should she so wish, she could even be accompanied by a young gentleman. Tea rooms were opened in both London’s leading hotels and London’s leading department stores, where ladies were provided with a space in which to rest, to take tea, and to write the copious letters integral to a woman’s busy day. A tea room was also a most respectable manner in which to make a living. For ladies who had fallen on hard times, or even aristocratic women wanting to express their independence (and earn a little money), tea rooms were an extremely lucrative business. 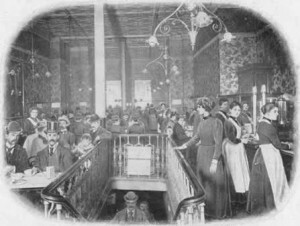 Tea rooms were also significant to the growth of female independence and a separate feminine sphere, and many of them were a hotbed of agitation for women’s suffrage. 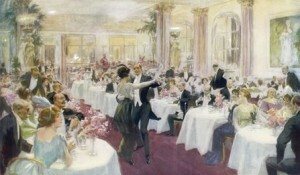 By 1910, the higher-end tea rooms became a little more sophisticated: palm court orchestras were added, the food became a little more cosmopolitan, cocktails were served, space for dancing was created, and afternoon tea was transformed into thé dansant. Me too! I found this website, which lists the tea rooms currently in business in the United States. In 2001, I visited London and stayed at the Park Lane in Piccadilly. My sister-in-law and I had tea at the Palm Court. What an experience! Evangeline, one of the joys of every trip to London that I take, is having Afternoon Tea in a different place. Over the years, I’ve had tea at The Ritz, Harrods, Brown’s, The Savoy, the Lanesborough, The Berkeley and Claridges among others. This last trip I had tea at the Wosleley which was delightful. If you are ever in NY, you must have tea at Lady Mendl’s. Lovely piece. It must have been so liberating to go out to tea with a girl friend. Readers in and around London might be interested to have a look at the new Lyons corner house display in the newly re-opened galleries of the Museum of London. It has a wonderful selection of photographs, menus, not to mention some lurid fake cakes. It captures a little of the atmosphere of something that was once as familiar as Starbucks. Hi Gary, I got the picture from the Mary Evans Picture Library.